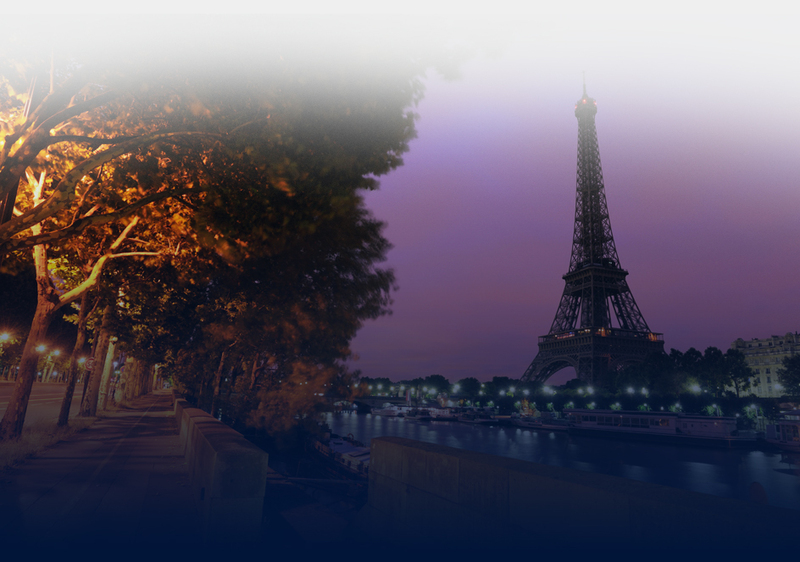 Arrive in Paris, meet and greet at the airport and transfer to our hotel, free afternoon. Evening – Paris by night! The seaside town of Arromanches was designated as Gold Beach by the allies during the Normandy invasion of World War II. It features one of the area's oldest and most respected D-Day museums, the Musee du Debarquement. Offshore, remnants remain of the artificial Mulberry Harbor, code-named by the Allies to facilitate the massive flow of supplies for the invading army. The German gun batteries at Longues-Sur-Mer are well-preserved and offer spectacular examples of the massive firepower the Allies endured while storming the Normandy beaches. These four German 152mm gun batteries are preserved on the coast in the midst of a working French farm and remind us of the extraordinary circumstances of the time. The batteries were finally knocked out by Allied warships following a day long duel. Three of the guns remain in their original massive concrete bunkers. Make sure to tour the range-finding bunker near the cliff side. Peering from the concrete observation post facing the sea, one can only imagine what the Germans felt when they witnesses the approach of 5,000 allied ships. Situated above Omaha Beach, where the American military suffered staggering casualties on D-Day, the American cemetery at Colleville-Sur-Mer contains the remains of nearly 10,000 service-men who died during the Normandy campaign. With marble crosses and Stars of David stretching as far as the eye can see, the cemetery is a solemn, breathtaking experience that all Americans should share. Strategically located between American landing beaches Omaha and Utah, La Pointe du Hoc remains virtually unchanged from the time when American Army Rangers scaled its sheer cliffs under deadly fire to knock out huge coastal guns that had already before their arrival. Pocked by huge craters left by naval bombardment, most of the German bunkers remain. The cliff-side battlefield also offers a scenic view of the French coastline that suffered some of the war's fiercest fighting. Our Normandy visit will close with A Memorial Service led by our Cantors Team. Wednesday Night Dinner with members of the French Jewish Community and the Israeli Ambassador in Paris. The evening will include a showing of the Documentary: 100 Voices – A Journey Home. Today in France we will meet with Jewish leaders and learn about the problems facing Jews in France. * A guided visit to the Eiffel Tower to admire the superb panorama over Paris. Night program: First of the Three European City Concerts featuring world- famous cantors. We will mingle with the Paris Jewish community that will fill the concert hall for this gala performance. Experience a symphonic cantorial choir, featuring music of mixed traditions: The familiar Austro-Germanic tradition of the Eastern European and Chassidic tradition and of the contemporary music scene in the synagogue world. The symphonic choir returns with gems of the synagogue tradition for Shabbat morning; the virtual Kugel of the Shabbat morning music. Optional tours; walking tours of old Vienna. Visit Vienna's inner city where you will find some of the most elegant and expensive of Vienna's districts. Splendid boutiques, expensive hotels,and popular cafés such as the Demel, the Burgtheatre, the State Opera and most of the historic monuments located in the Innere Stadt (inner city). This area is also the home of many important politicians and the Austrian President. Here you will find medieval Vienna: the old houses, narrowly cobbled streets and romantic squares where one almost expects Mozart to appear around the next corner. Right through the 1st District runs Kärtnerstraße, a pedestrian zone and shopping boulevard with the State Opera at one end and Stephansplatz with Stetephansdom at the other. Evening: The second of the 3 European Cities Concert – featuring world famous cantors. Here too, we will mingle with the Vienna Jewish community that will fill the concert hall for this gala performance. Morning: breakfast with members of the Warsaw Jewish Community and Polish Government. Rabbi Schudrich, Rabbi Schuman, Gebert, Halberstad – A presentation of the New Museum of the History of the Polish Jews. Warsaw Jewish Cemetery – One of the largest, preserved Jewish cemeteries in all of Europe, established in 1806, the 250,000 grave-stones contain rich historical and genealogical knowledge. This is the burial site of famous writers, artists, poets, as well as religious and political leaders. Most recently Marek Edelman, the last surviving commander of the 1943 Warsaw Ghetto Uprising, was buried here in October 2009. Warsaw Ghetto Monuments – The first ghetto memorial, dedicated by Polish Jews in 1946, resembles a manhole cover, recalling the underground's use of the city sewers as escape and smuggling routes. It is located close to the Monument to the Heroes of the Ghetto, a copy of which stands in Yad Vashem in Jerusalem. 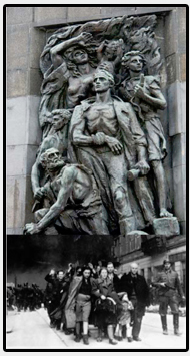 The massive two-sided monument was sculpted by Natan Rappaport and unveiled on the fifth anniversary of the Ghetto Uprising in 1948. We will hold a short ceremony to commemorate the 1943 Ghetto Uprising, with poetry and music composed in the Warsaw Ghetto. Nearby stands a tree and a commemorative marker honoring "Zegota," an arm of the Polish Government in Exile and Europe's only organization specifically tasked with aiding and rescuing Jews during the Holocaust period. Thousands of Jewish lives were saved thanks to the extraordinary, clandestine efforts of Zegota. Across from the Rappaport Monument is the site of the future Museum of the History of Polish Jews, scheduled to open in 2012 with primarily federal funds and donated land. We will have a brief presentation by the Museum's chief curator. Mila 18 – headquarters of the ŻOB, a Jewish resistance group in the Warsaw Ghetto during WWII. Discovered by the Germans on May 8, 1943, the leaders of the uprising Mordechaj Anielewicz, Arie Wilner and many others, took their own lives. Two monuments honor their memories and mark their common grave. Ghetto Wall Marker No. 21- In 2008, the City of Warsaw in cooperation with the Jewish Historical Institute, erected 21 vertical markers and a series of plaques inlaid in the ground indicating the borders of the Warsaw ghetto. Umschlagplatz Monument - a stone monument erected in 1988 resembling an open freight car used to transport Jews to the death camps. It stands on the site in the Warsaw ghetto from which more than 300 ,000 Jews were deported to the Treblinka extermination camp. Scenes from the film "The Pianist" were filmed just a short distance up Stawski Street. The third and final performance of the 3 European Cities Concert This concert is dedicated to late President Lech Kaczynski of Poland, First Lady Maria Kaczynska and the many leaders and patriots who perished in the plane crash, April 10, 2010 at Smolensk, Russia. The president and many of the victims were true friends of Israel and the USA. The Warsaw community will be with us for this performance and proceeds from will go directly to help the families of the crash victims. Back home, or take the 2 day optional excursion to Krakow and Auschwitz. The Kazimierz Jewish District - Krakow's Jewish community, which dates back to the 14th century, was transferred from the heart of Krakow's Old Town by King Jan I Olbracht following a fire in 1495. Jews were relocated to Kazimierz and this became the main Jewish neighborhood (kehilla) in the region and one of the largest Jewish communities in Poland. Tempel Synagogue of Krakow – Built in 1862 and beautifully renovated, this Moorish style Reform synagogue, the largest synagogue in Krakow and used during the High Holidays and for special events such as Jewish Culture Festival concerts. Stary (Old) Synagogue – A Gothic structure built early in the 15th century, this is the oldest synagogue in Krakow and the oldest synagogue still in use north of the Alps. The Old Jewish Cemetery is where some of the most famous Kabbalist rabbis of Poland were buried. "Under the Eagle" Pharmacy –During WWII, many Christian Poles, such as Dr. Tadeusz Pankiewicz, helped Jews by providing food and medicine through this pharmacy located in the Krakow ghetto. 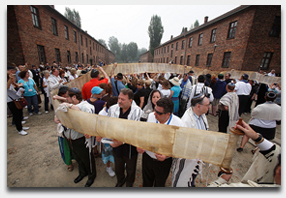 The ghetto was liquidated in 1943 and the remaining Jews were transported to the Plaszow and Auschwitz camps. Schindler's Factory and Plaszow – the site of the former Nazi concentration camp enamelware center, where Oskar Schindler saved almost 1200 Jews, Schindlerjuden ("Schindler's Jews"), by employing them in his factories in Krakow and the Czechoslovakia. Evening: Enjoy the night life of this unique and picturesque city. Today we pay homage to those who suffered and perished in Auschwitz-Birkenau, the notorious Nazi Concentration and death camps established by Germans in 1940. In 1942-1944, as part of the "final solution of the Jewish question" (Endlösung der Judenfrage), Auschwitz served as the largest Nazi center for the destruction of the Jewish population of the Europe and countries occupied by and allied to the Third Reich. Our visit will help us to understand the extent of the horror and terror and to appreciate the miracle that anyone survived. Auschwitz-Birkenau has been described by Elie Wiesel as that which "arouses man's most secret anguish." Here we will participate in a Shacharit and memorial service for all who perished at Auschwitz-Birkenau. Jewish leadership – JCC, the Galicia Museum, Jewish and gentile Judaic scholars and more.